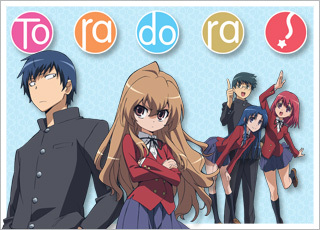 Toradora! 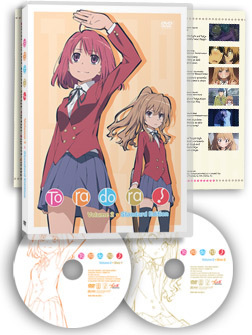 | NIS America, Inc.
Home / anime / Toradora! Due to his frightening appearance, Ryuji lives a rather unfortunate life. 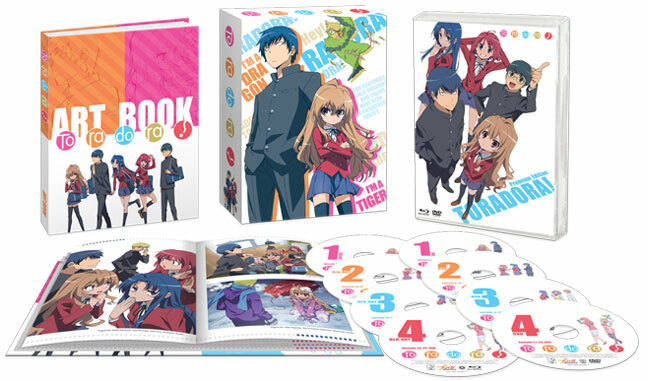 On the first day of his junior year of high school, he meets a strange girl named Taiga.She is better known as the Palm-top Tiger. Despite looking small and cute, she is extremely short-tempered and nobody can stop her once she starts throwing punches.However, Ryuji learns a secret about Taiga nobody else knows...The dragon and the tiger join forces to bring you a monolithic romantic comedy! The high school romantic comedy continues as Ryuji and Taiga slowly begin to understand their feelings not just towards their crushes, but what they mean to one another. After the Culture Festival comes to a close, Kitamura begins to display a rebellious attitude for some reason. To bring him around, Ryuji tells Taiga to run for Student Council President. Christmas pageants, complete with a beautiful song, come and go. 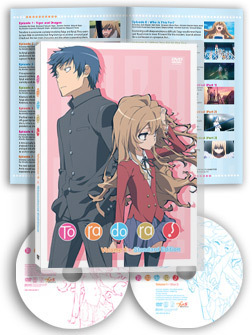 During a school trip to a ski resort, Ryuji will learn the truth about Taiga's heart. What will he do with this knowledge? The tiger and dragon stand together, but are they strong enough to face the obstacles life will throw at them? 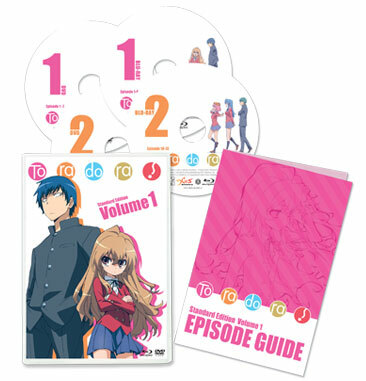 Premium box with bonus item: A full-color, 68-page hardcover art book, which provides an episode guide, character and relationship info, and gorgeous full color illustrations. 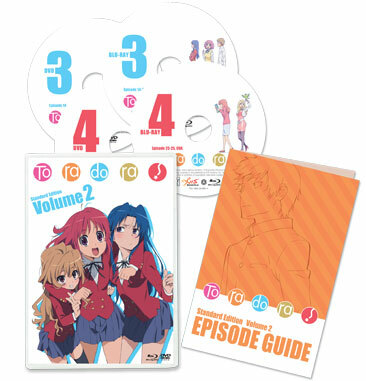 Bonus content: Clean opening/ending, 2 mini episodes, and bonus clip, "Ami's Impersonations"
Bonus content: Clean opening/ending, and more! Unfortunately for him, those around him think he's a delinquent due to his frightening eyes he inherited from his father. Despite everyone's thoughts, he's a kind person who has learned to cook and clean very well due to living in a single-parent household. He harbors secret feelings for his classmate, Minori. A beautiful girl standing a mere 4'7" tall. She may be cute, but her temper is as short as she is, earning her the name Palm-top Tiger. 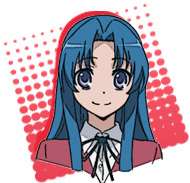 She's really just a clumsy girl who gets very shy and awkward around Kitamura, whom she has a crush on. 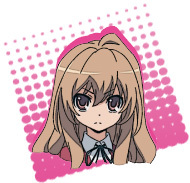 Taiga's best friend. 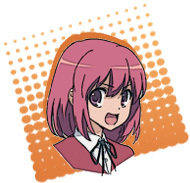 Her nickname is Minorin. She's got a great smile, passionate heart, and is a truly out-of-this-world character. She takes on multiple part-time jobs on top of being the captain of the girl's softball team. Ryuji's best friend and vice-president of the student council. He is also the captain of the boy's baseball team. 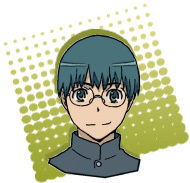 Thanks to his glasses and position in the school, he is nicknamed Maruo by fellow classmates. He may be smart, but he is a bit strange. 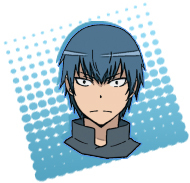 Kitamura's childhood friend. She transferred into Ryuji's class from a different school. She is a famous fashion model and it shows with her gorgeous looks and sense of style. It seems like she has it all, what with her figure and equally alluring personality, but it turns out she's really quite the two-faced, mean girl.